There can be few monasteries as strange as Deir es-Sultan, home of the Ethiopian Orthodox Church in the Old City of Jerusalem. To come across it without warning is an unusual experience. One walks up a flight of steps behind the Church of the Holy Sepulchre, through a gateway in an old stone wall, and suddenly a tiny African village is revealed: a group of low mud huts huddled together from which comes the clatter of cooking pots. From the middle of a courtyard rises a small and elegant dome. Two priests sit idly chatting on a stone bench. It takes a little time to realize that this is the roof of the Holy Sepulchre itself and that the dome is giving light to the chapel of Saint Helena below, one of the most ancient parts of the complex which make up the most sacred of Christian sites in Jerusalem. Around the sides of the courtyard are old and shattered walls and in their interstices grow some of those brave and courageous plants which find lodging in the most inhospitable terrain. The Ethiopian church in Jerusalem itself resembles a plant which in Jerusalem has found poor soil but has continued to grow in defiance of the laws of probability and to survive the hardest of winters and the hottest of summers. Leading off the courtyard is a small chapel where the monks worship. The chapel is dedicated to Saint Michael the Archangel. It is not an impressive structure. A small oblong building, it is capable of seating about 70, with room for a further 40-50 to stand packed together at the times of the great festivals. Below it is another small chapel which also belongs to the Ethiopians, dedicated to “the four living creatures,” in reference to Ezekiel where the prophet beholds four living creatures, one of which has four faces and all of them four wings. The very naming of the chapels is an indication of the deep affinity that the Ethiopian Church feels for the Bible and for Jerusalem. Another indication of this is given by pictures round the walls of the chapel of St. Michael. They are only about 100 years old, but are in that very distinctive and, to an outsider, exotic style which is peculiarly Ethiopian. The faces of those illustrated are all shown frontally and the eyes in particular stare out with a strange innocence. Their pupils are painted black and are large and lustrous. The largest picture in the chapel shows King Solomon receiving the Queen of Sheba. Around him stand dignitaries while the queen arrives with a large and heavily loaded camel in her train. Among those close to Solomon are two incongruous figures clad in the black costume of Hassidic Jews, a costume which though still to be seen in Jerusalem today, originated in the Europe of the 17th century and would have caused some surprise at the court of Solomon. Who are the Ethiopian Christians who live in this strange environment? Why have they chosen to build on the roof rather than find space in the Holy Sepulchre itself like most of the other ancient Christian churches? The Greeks, the Armenians, the Catholics have secured large portions of the holy site and the Ethiopian Church is only a little less ancient than these. The answer lies in the fact that the Ethiopian Church, though ancient, has always been politically weak, receiving help from Ethiopia itself only at certain periods and in limited measure. Its representatives in Jerusalem were not able to establish a claim to part of the church proper and had to make do with the roof. 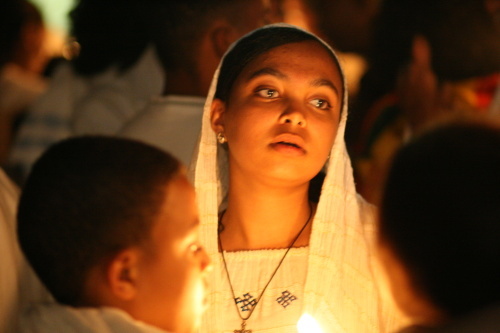 According to tradition, the Ethiopians were converted to Christianity in the fourth and fifth centuries by monks, some of whom came from Egypt and some from Syria. These first missionaries found the way prepared for them by the fact that there had been ancient contacts between the Holy Land and Ethiopia. The existence of the ancient Jewish community of Ethiopia is another indication of these contacts. So too is the fact that in the Ethiopian Church there are many features which are peculiarly close to the traditions of Judaism and which are not found elsewhere in Christianity. For example, the Ethiopian Church still practices the circumcision of males after eight days; Saturday in the Ethiopian tradition is a second holy day little less important than Sunday; and in the churches of the Ethiopians the Ark of the Lord features largely. Again the tradition of dancing which is important to Ethiopian ritual and liturgy seems to owe its inspiration at least in part to the dance of David before the Ark. Most famous of these ancient traditions is of course the visit of the Queen of Sheba to Solomon. Though in the Book of Kings itself, Sheba is not specifically equated with the queen of Ethiopia, no Ethiopian Christian doubts that she came from his country. “And when the Queen of Sheba heard of the fame of Solomon concerning the name of the Lord, she came to prove him with hard questions. And she came to Jerusalem with a very great train, with camels that bear spices, and very much gold, and precious stones: and when she was come to Solomon she communed with him of all that was in her heart.” (I Kings 10:13). The picture that is seen in the Chapel of St. Michael is only one of many tens of thousands of illustrations of the famous visit to be found in Ethiopian churches and homes everywhere. Tradition in the Ethiopian Church has it that Sheba returned home pregnant and that her son Menelik I, the legendary first emperor of Ethiopia, was her son by Solomon. It is said that Menelik travelled to Jerusalem as a young man to learn more of the wisdom of Solomon and take it back to his own country. It was perhaps because they found a knowledge of Jerusalem and Jews already existed in Ethiopia that when the Christian missionaries came to the highlands of Ethiopia they were able to speak to the people more easily. In any event, however it may have been, the Christian faith rapidly spread in Ethiopia and according to St. Jerome, by the end of the fourth century Ethiopians were already making pilgrimages to Jerusalem. In the year 636 ce the Caliph Omar, who had entered Jerusalem as a conqueror, issued a firman which set out the rights of Christians in Jerusalem, among them the rights of the Ethiopian Church. However, little is known of any contacts between the Ethiopian Church and the Holy Land from this early period until the Middle Ages. The Ethiopians themselves believe that a community survived in Jerusalem and that it was supported by funds donated by pilgrims and by occasional gifts from Ethiopian emperors. There is also little reason to doubt that even at this early stage those contacts were difficult to maintain. The survival of the Ethiopian Church in its home in Africa itself was not easy. On all sides it was surrounded by hostile forces. While the pagans of the interior of Africa certainly had no use for Christianity, a more tangible threat came from the conversion of the peoples of the Sudan and the Horn of Africa to Islam. The fortunes of the Church and of the state of Ethiopia were closely linked and when successive monarchs assumed the throne and fought against their enemies with vigour all was well, but when, as happened on several occasions, the Moslems gained the upper hand, the future of the Church looked bleak. These fluctuations affected the Ethiopians in Jerusalem and continue to affect them up to the present day. They depend upon contacts with Ethiopia and when those contacts are interrupted their economic and political position declines. However, the very fact that the Church had to struggle to survive both in Ethiopia and in the Holy Land gave it strength, the strength of faith. Also in its favour was the fact that it was not highly centralized. The Ethiopian Church in Ethiopia itself was led by an abuna, or bishop, sent from Egypt to be its leader. This was an ancient tradition dating right back to the very establishment of the church. The abuna, however, had but limited power. Very often he did not know the language of the country to which he was sent and his relations with the local clergy were poor, especially if he tried to enforce discipline on them. For their part, the Christians of Ethiopia centered their tradition on the ancient monasteries and the holy places they established high up in the mountains. These monasteries were the homes of tradition, of culture and of scholarship. In them lived the saints and holy men who played so large a part in Ethiopian religious life. They practiced austerities in the tradition of the Egyptian Church and its monks, and the places where they lived became centres of pilgrimage. They seem to have somewhat resembled the gurus of India today in that they could attract people regardless of where they lived and indifferent to ecclesiastical hierarchy, simply by the way in which they impressed the faithful. The fact that the church depended upon the individual sanctity of holy men for much of its strength gave it resilience. It is very likely that in Jerusalem too, the experience of struggle and persecution in Ethiopia itself was put to good use by abbots and monks determined to survive despite the circumstances. Jerusalem bulked large in the eyes of the Ethiopians. In Ethiopia itself, surrounded as it was on all sides by enemies, they could find no community of values with most of their non-Christian neighbours and seldom sought contact with them; the sole exception was the relations with the Coptic Church of Egypt and even these soured after 1700. It was natural, therefore, that in 1937, when Emperor Haile Selassie, one of whose formal titles was “Lion of Judah,” fled from the invading Italians, he made his way first to Jerusalem where he remained until restored to his throne by the British in 1941. Jerusalem was one of the few windows on the world which the Ethiopians enjoyed throughout the centuries. The Ethiopian Christians resident in Jerusalem often appear in written accounts by mediaeval pilgrims. Writers such as the Dominican Friar Burcardus de Monte Sion in 1283 refer to the piety of the Ethiopians and to their customs. In 1347, Father Nicolo da Pogibonsy, a Franciscan friar from France, who visited the Holy Land that year describes the Ethiopians praying in a chapel called “St. Mary in Golgotha” in the Holy Sepulchre. It is at this time too that the Ethiopian Church in Jerusalem makes a brief appearance on the wider stage. In the year 1438, an Ethiopian delegation attended the Council of Florence which was designed to recreate the unity of Christianity primarily by getting the Greek Orthodox and Catholic Churches together. The Ethiopians were represented by the abbot of the Church from Jerusalem. His embassy attracted considerable curiosity although there appeared to have been no practical results as a result of his participation. In the 16th century matters took a turn for the worse. The Ethiopian Kingdom was under attack from Ahmad Gran, the ruler of Harar, a Moslem principality east of Ethiopia, and was almost destroyed. Churches were burned, Christians persecuted and forcibly converted, and the emperor compelled to flee. In these circumstances no one had much time to think about Jerusalem, and the community languished. Through poverty they lost their foothold in the main building of the Holy Sepulchre and were finally forced on to the roof, where they remain to this day. But even there the Ethiopians were not safe. The more powerful churches which enjoyed active support from the rulers of their faith slowly began to encroach upon the Ethiopian properties. Many such properties which had been noted as belonging to the Ethiopians in earlier times are now no longer in their possession. The Ethiopians somehow managed to hold out, though there are many references to their poverty and the fact that they depended on charity from the Armenians and others for their survival. Writing in the 19th century, an Anglican missionary, William Jarret, notes that some Ethiopian monks joined the Greek Orthodox Church simply to get food. One group which was particularly antagonistic to the Ethiopians was, surprisingly, the Coptic Church of Egypt. Though the Coptic and Ethiopian Churches were closely allied in terms of theology and organization, the Copts resented the fact that the Ethiopians had broken away from them in the 18th century. When the fortunes of the Ethiopians were at a very low ebb in the early 19th century, the Copts began to harass them. 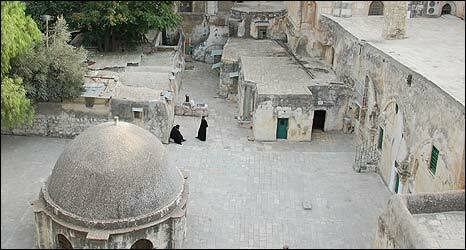 The ownership of the rooftop monastery of Deir es-Sultan was challenged by the Copts who claimed that it belonged to them. In the year 1838 when plague struck Jerusalem and all the Ethiopian monks died, the Copts took over the monastery and, according to the Ethiopians, burned the library containing the documents which validated the Ethiopian claim to Deir es-Sultan. With their library burnt and their monks dead the Ethiopians might well have been expected to disappear from Jerusalem. They were saved by a curious combination of circumstances. Of course the emperor and Church in Ethiopia wanted to maintain links with Jerusalem and a foothold in the Holy Land but they might not have been able to do so had it not been for the fact that their aspirations were supported by the British. The Anglican bishop of Jerusalem, Bishop Gobat, had served as a missionary in Ethiopia and had an ambition to convert the Ethiopian Church to Anglicanism, an idea which seems somewhat surprising today. As a mass of correspondence between the British consul and the Foreign Office in London attests, he extended support to the Ethiopians and fought for their rights. The bitter fight between the Ethiopian Church and the Coptic Church has continued to the present day. When, with British support, the Ethiopians were able to recover the Deir es-Sultan monastery, the keys to the place were left in the hands of the Copts. Confusion and dispute over who owned what went on without interruption. As late as the 1960s, the Jordanian government attempted to intervene in the dispute after there had been a serious fracas over the use of part of the building. Today there is an as yet unresolved case before the Israeli High Court. The Ethiopians have, of course, no doubt as to their rights and have produced a series of documents on the subject, the latest of which was presented to the Israeli delegation to the Israeli-Egyptian Normalization Talks at the Ethiopian Church in Jerusalem in September, 1986. In the latter half of the 19th century, the position of the Church in the Holy Land began to improve. This was largely because in Ethiopia itself a series of strong monarchs had come to power who began to unite the various provinces under one centralized administration. The Emperor Yohanes came to the throne and began to assert himself to improve Ethiopia’s position on a wider stage. He was fortunate that in Jerusalem at that time the leader of the community was one of the few Ethiopian individuals known to history by more than his name. He was Abbawalda Sama’et Walda Yohanes, a man of energy and vigour. In the year 1888, the community bought a plot of land outside the walls of Jerusalem with treasure which Emperor Yohanes had captured from the Turks; some said he had captured three boxes of treasure, some seven, but however much it was, it was enough to buy the land and begin construction of a new monastery and church. This complex is called Debre Gannet which means the “Monastery of Paradise” in Amharic. It is situated off Prophets’ Street in Jerusalem and gave its name to Ethiopia Street on which it stands. Once the decision to build a new church was taken, the whole position of the Ethiopians began to change for the better. The community grew larger until some 40-50 monks and a smaller number of nuns were in residence by 1900, a number which it has maintained up until today. Many of the nuns were widows of priests (for priests in the Ethiopian church are not celibate) or members of aristocratic families who came to Jerusalem in pious retirement to houses which they built and lived in, and, on their death, donated to the community. The Israel Broadcasting Authority building in Jerusalem is housed in a building belonging to the Ethiopian Church for which rent is paid. The “new” church – Debre Gannet – is an impressive building built on a circular pattern used in most of the principal churches of Ethiopia. It is entered through a large door and stands in a quiet and secluded courtyard. Once inside, the worshipper is aware of its very considerable height. There is no nave as in most western churches but rather a great circular corridor which surrounds the central Ark and which is made attractive to the worshipper as well as to the seeker after aesthetic pleasure, by the presence of a variety of pictures dating back some hundred years or so, most showing saints of the church. Debre Gannet now shares with Deir es-Sultan the role of providing a home for the monastic community of Ethiopians in the Holy Land. During the last hundred years they have also acquired properties in Bethany, Jericho and on the river Jordan. The fortunes of the Church would thus appear to have improved, but there are still difficulties. Many of these have been caused over the last 50 years by political turmoil in Ethiopia itself. In 1936, when the Italians conquered Ethiopia, some of the monks recognized the Italian rule in their country while others refused. The struggle between the two parties resolved in favour of the Ethiopian nationalists in 1941 when the Italians were defeated. The monks who had supported the Italians were driven out of the Jerusalem monastery and reduced to utter penury from which they were only relieved by a grudging pension paid by the British mandatory authorities. The overthrow of the Emperor Haile Selassie by the communists in 1973 was another cause for turmoil. Some monks who were loyal to the imperial regime were no longer able to remain in the monastery while the community itself was augmented by a number of individuals, not all of them monks, who had left Ethiopia for political reasons. Today the community of monks and nuns has been augmented by a sizable group of lay people. There was a variety of internal conflicts which arose as a direct result of antagonism between those who had felt at home only with the government of the Emperor and with the traditional social order and those who were prepared to compromise with change. In this the community in Jerusalem only reflected the wider concerns of the Church in Ethiopia itself. The recent defeat of the communist regime in Ethiopia and the establishment of an Ethiopian embassy in Israel have, however, improved matters so far as the community in Jerusalem is concerned. For more than 1500 years, the Church of Ethiopia has survived in Jerusalem. Its survival has not, in the last resort, been dependent on politics, but on the faith of individual monks and it is to the lives of these monks that we should look for the vindication of the Church’s presence in Jerusalem. The Ethiopian monks of today, whether in Jerusalem or in Ethiopia itself, are supported by revenues from church lands and properties and gifts of the faithful. The monks are far from rich. They are attracted to Jerusalem not by a hope for material gain or comfort, but by faith. It has been a feature of the Ethiopian Church in Jerusalem that its members, who are Amharic-speaking, seldom became fluent in the tongues of the country in which they live. Even today many monks speak neither Arabic nor Hebrew, nor indeed any other language, and are entirely dependent for their contact with the outside world on those of the community who do. Most of them are men of simple piety brought to Jerusalem by the belief that it is the most holy of Holy Places. The life they lead is highly structured. Meals are eaten in common and their whole life revolves around prayer services and great feasts. The monks take part in services held twice a day between four and six a.m. and between four and five p.m. On the days immediately preceding Easter as well as the Feast of Our Lady, in August, the morning service lasts from two to six a.m. On other saints’ days, the qudase, or Mass, is celebrated. The services involve long periods of standing and it is for this reason that a feature of the church is the long sticks with carved chin rests which the monks use for support. Similar sticks, incidentally, are used by shepherds in Ethiopia as they watch their flocks. Perhaps the most memorable of the Easter activities is Palm Sunday. For this celebration of the entry of Christ to Jerusalem, not only monks but all the lay members of the 300 or so Ethiopian community in Jerusalem gather in the courtyard of Deir es-Sultan. 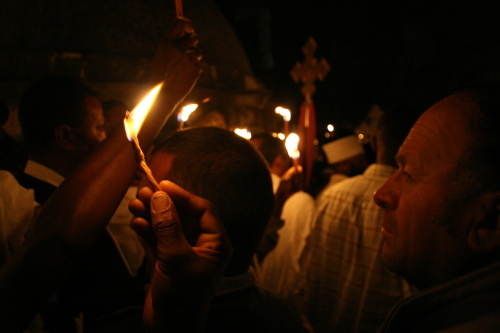 All over Jerusalem other Christians are also celebrating Palm Sunday but none do so in a more heartfelt way than the Ethiopians, who act out the events of Easter week in a style all their own. The service begins at midnight in the Chapel of St. Michael in Deir es-Sultan, and lasts until eight a.m. Of this, six hours is a special commemorative service and the remaining two celebrate the Mass. It is not only monks who have stomach for so long a service. At the back of the church stand women, in traditional cotton dresses and shawls of white. The faces of the congregation are remarkable for their concentration. At about half-past eight at the end of the service, everybody leaves the chapel and comes out on the roof looking cheerful and not in the least tired. The archbishop and his fellow priests go into a large tent nearby where they prepare themselves for the solemn procession. There they begin their prayers chanting “I rejoiced when they said unto thee Let us go unto the House of the Lord’. Our feet shall stand within thy gates; Jerusalem is builded as a city.” At the end of the service palm branches are brought to the archbishop who blesses them and distributes them to the congregation and to the monks. The whole crowd walks in procession round the courtyard. For outsiders, part of the interest in these celebrations is in the exoticism: the elaborate ecclesiastical garments of the priests and especially the archbishop and his senior colleagues; the decorated and tasseled umbrellas in velvet and gold which are held over the heads of notables, the music itself and the presence among the crowd of a few itinerant musicians playing on small stringed instruments and singing spontaneous hymns of praise to the crowd. For the monks the ceremony has a different meaning – it is the high point of the year, the ultimate celebration of their faith. When they are not taking part in feasts or fasts (there are a great number of fasts in the Ethiopian rite), the monks and nuns make use of their time for their own spiritual practice. 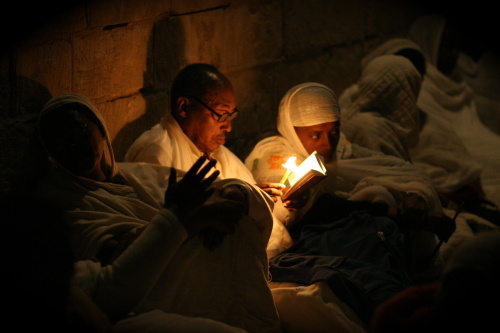 Private prayers are a very important part of the monastic life of the Ethiopian church. Their characteristic method is the repetition of certain sacred texts. The Psalms of David are particularly appreciated, as is the Gospel of St. John. However, the Ethiopian monks must also contribute to the communal life of the monastery. They are bound by a rule which is perhaps less strict than that of some Western monks but still demands of them celibacy, the avoidance of sin, and obedience to the abbot. They are also expected to look after themselves insofar as they must garden, clean and paint their houses and share in the life of the community. However, they do not live in communal dwellings as do monks in the Catholic tradition. They are also given considerable latitude in their choice of activities. Some have taken up painting and woodcarving while others prefer to spend their time in study; one or two have withdrawn from the world and become solitary hermits. The most famous of these, who died in the early eighties, was a monk who did not speak for 30 years but who, if appealed to by an individual, would give his guidance in writing. This man, who acquired a reputation for sanctity, was buried as a saint. As for the lay community of devout individuals and, on occasion, political exiles, it is more closely involved with society outside the monasteries than are the monks and nuns. 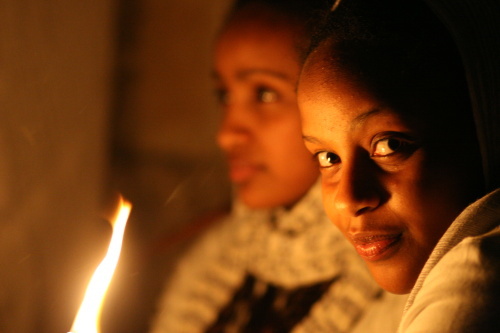 Members of the Ethiopian community work as nursing sisters in hospitals and the young people study in the Anglican School, an international school in Jerusalem, or in regular Israeli schools. 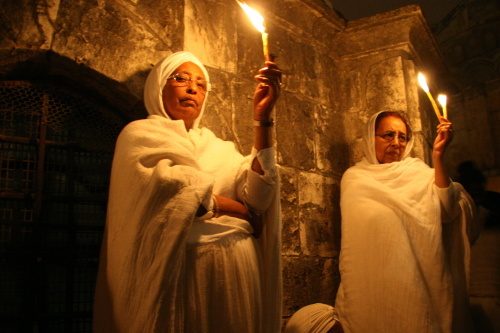 In recent years, the pilgrimage to Jerusalem from Ethiopia has attracted more and more people. In 1993, some 450 pilgrims flew to Jerusalem at Easter. Looking after them provides a source of income for the local community. However, the community as a whole is still a poor one and has a constant struggle to preserve its identity. A small school maintained with care and affection provides instruction in Amharic and in the traditions of the Ethiopian community and Church in Ethiopia but it only functions at weekends. The arrival of some 30,000 Jews from Ethiopia during the last few years has, to some extent, served to diminish the sense of isolation of the Ethiopian Christian community but it has not much affected its day-to-day life. The monks of the Ethiopian Church live, as it were, on an island where their lives change very slowly – an island to which they have been drawn through faith and where they have found a degree of contentment. Asked why he had come to Jerusalem, one elderly monk at first seemed to fail to grasp the question. Then he burst out “because it is Jerusalem” – an answer he felt quite sufficient, as indeed it is.